There are many opportunities for reporters to cover the camp. For more information, please contact Brian Mattmiller, Morgridge chief communications officer, at bmattmiller@morgridge.org. For two weeks in July, more than 50 Wisconsin rural high school students and 10 teachers will converge on Madison to get a taste of stem cell science, rubbing elbows in labs with some of the world’s leading researchers in regenerative medicine. Now in its 11th year, the Morgridge Institute for Research has sponsored the weeklong camps to expose students from underserved areas to a field that is transforming human health. The goal is to spur further career interest in science, technology, engineering and math (STEM) fields. Top scientists, as well as graduate and undergraduate students, from the University of Wisconsin–Madison and Morgridge volunteer teaching and leading experiments as part of the program. 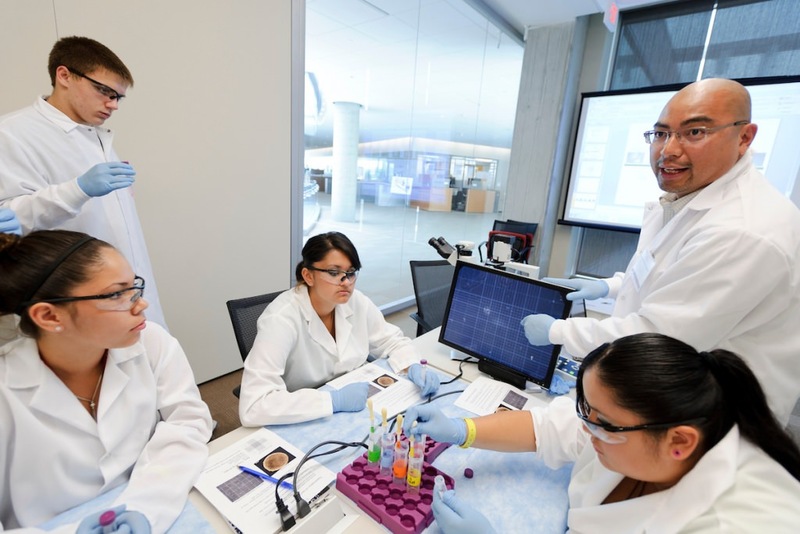 Students conduct experiments and hear talks on gene transfer, cardiac cell differentiation, drug discovery, tissue engineering and other topics. The week culminates with poster sessions given to employees in the Discovery Building, 330 North Orchard Street. Kickapoo Area School District in Viola; the North Crawford School District in Soldiers Grove; Iola-Scandinavia School District in Iola; Black Hawk School District in South Wayne; Chetek-Weyerhauser School District in Chetek; Lancaster High School; Phillips High School; Bruce High School; Coleman High School; and Hillsboro High School.